Double MX Nationals podium for Buildbase Honda at Hawkstone! British Ladies Quadcross Champion to be crowned in 2019! News just in from Nora MX, which is there is to be an official ladies ACU British Quadcross champion and runner up in 2019. 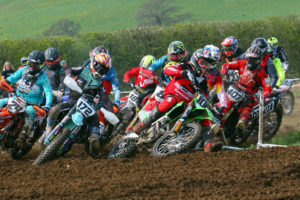 Nora MX boasts and prides themselves on welcoming and challenging, more women/lady riders than any other club in the UK. Hopefully this new title will make the women’s side of the sport grow. This championship will run within the novice group which has been a terrific success for the club. The brand new British title has been recognized by the MX committee and the ACU and for 2019 as have the Masters, Clubman and Youth classes which run with the Nora MX Quadcross events. There are 7 rounds to contest at some terrific venues, with Nora running at 6 brilliant tracks over the 7 round series (with all rounds counting ). The club are proud to have terrific timekeeping, recovery and cqc compliant Medical staff, championship status, website and awards ceremony, and are unequaled by any quad club in Europe! So come on ladies… if you enter novice class you will automatically be included in the new official ladies British championship!